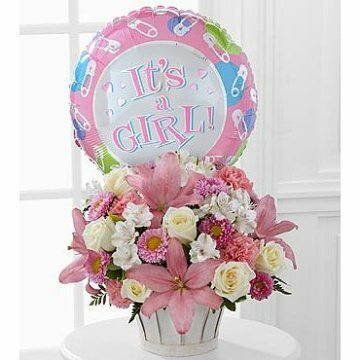 The Girls Are Great!® Bouquet by FTD® is blooming with sweet love to congratulate the new family on thier darling baby girl! White roses, white Peruvian lilies, pink carnations, pink matsumoto asters, pink Asiatic lilies and lush greens are beautifully arranged in a round whitewash woodchip basket. Presented with a mylar balloon declaring, "It's a Girl! ", this incredible flower arrangement is the perfect welcome for their new addition. Standard bouquet includes 12 stems. Approximately 11"H x 11"W.
Deluxe bouquet includes 15 stems. Approximately 13"H x 13"W.
Premium bouquet includes 19 stems. Approximately 13"H x 15"W.